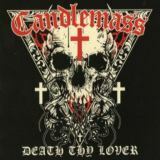 After the announcement in 2012 that Psalms for the Dead would be Candlemass' farewell album, fans were resigned to them slipping away into legend. Yet things haven't quite worked out that way, the band continuing to tour and this year releasing an EP to mark the thirtieth anniversary of the release of Epicus Doomicus Metallicus. They've also announced that the tour singer, Mats Levén, was now the band's permanent frontman after Rob Lowe's departure in 2012. It seems not altogether out of the question that we'll get new Candlemass albums in the future, then, but in any case Death Thy Lover is a stunningly good set of songs that shows the Swedes still very much have it. Levén (having sung for everyone from At Vance to Yngwie J. Malmsteen in his time, including on underrated Leif Edling sideprojects Krux and Abstrakt Algebra) sounds very similar to Lowe and gives the already grandiose music a greater epic edge, while the band behind him have been playing together for decades and obviously sound excellent. The opening title track is probably the best, certainly the most rocking and catchiest. It could have come straight from the Psalms for the Dead sessions, having a similar heavier metal feel than their classic misery-monging. Those fans of other current Edling project Avatarium will be right at home, but the mid-track melodic breakdown that leads into some terrific soloing is heaven for any metalhead, and the triumphant ending to the song is perfect. Followed by the almost as good Sleeping Giant, which feels a little doomier, the EP continues to delight with Sinister and Sweet being even slower and gloomier if a little groovier, terrific songwriting and memorable and melodic riffs throughout showing the kids how it's done. And closing instrumental The Goose is a fine way to go out if this really is Candlemass' final new material, impressively striking a grandiose note without the vocals thanks to the melodic guitar lines. Few bands sound this good at their age; if this is the precursor to a comeback, then bring it on. A good way to mark the anniversary of the greatest doom metal album otherwise.